•Feed-in-Tariff Payments Can be very Substantial Based on Payment Adders. They will Range from Around 23 Cents per kilowatt Hour of Energy Produced, to 34 Cents a Kilowatt Hour if Combined with Community Solar, Energy Storage Backup and Energy Trackers. •A One Megawatt AC Dual-Cropping PV System will Produce around 1.2 million Kilowatt Hours a Year of Power . •This Means Gross Feed-in-Tariff Income Ranging from about $275,000 to $410,000 a Year for 20 Years before Expenses. • Farmer can Choose to Receive Quarterly Lease Payments for 20 Years. • Solar Panels are Mounted on Poles. Each pole has three panels, with lowest panel at least six feet ,above the ground poles spaced about four feet apart to limit shading to levels that have marginal effect in productivity, and rows of poles spaced to allow full use of agricultural machinery. 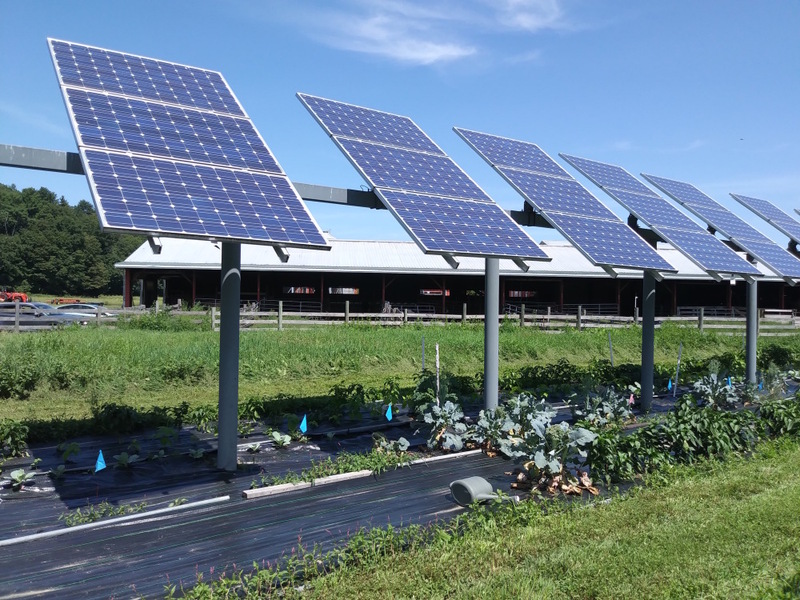 • UMASS research results suggest a space of 3.5 to 4.0ft (1 to 1.2m) is needed between panel clusters to maintain 90 to 95% of the pasture yield without shade from solar panels. • Each system layout in accord with recommendations of UMASS agricultural dual- cropping scientists. • A 1 megawatt instalation will require about 1200 poles on nine acres of pasture or crop land. Poles are installed with no permanet footings or soil disturbrance. All conduit and electrical connections are buried and do not a,ffect soil and farm operation. • The PV dual-crpping system willpay for any increase of personal property or real estate taxes due to its installation. We will negotiate a twenty year PILOT (Payment in Lieu of Taxes) with the Town or City to assure future predictable tax payments. Rationale: This Research Project is grounded in the understanding that there is a need for sustainable renewable energy sources for Massachusetts and the U.S. and we suggest solar power as an area of great promise. The map below compares how much land would be required to power Massachusetts with three forms of renewable energy. Only solar has the potential to substantially power the state while only using a reasonable amount of the state’s land mass. Traditional ground mounted solar installations on farmland, however, remove arable land from potential agricultural use. Research Goals: This project is exploring raised solar panels that enable use of the field under the solar panels as pasture as shown in the right figure above. The goal is to provide farmers and installers of solar PV options for installing solar arrays on farm fields without taking the field out of production. Treatments: In the project’s first phase, installation techniques were developed as 106 panels were installed in livestock pasture areas. New techniques were developed to install (drive) poles with no disturbance to the soil or crop underneath. At the same time, methods were developed to create stable structures without the use of large concrete bases which would have also created excess disturbance to the soil. Panels were installed about 7.5ft (2.3m) off the ground with spaces between panel clusters varying from 2 to 5ft. An experimental test site for dual use of land for photovoltaic and agricultural production has been proposed to demonstrate the feasibility of growing field crops under solar panels. The site would be available for applied field studies for vegetable crops. agricultural use of the underlying ground. Initial results suggest a space of 3.5 to 4.0ft (1 to 1.2m) is needed between panel clusters to maintain 90 to 95% of the pasture yield without shade from solar panels. Proposed panel cluster spacing treatments are 1.5ft, 2.5ft, 3.5ft, and 4.5ft. (45cm, 75cm, 105cm, and 135cm) plus control areas without panels. Green-shaded areas represent plot areas (panel cluster plus spacing between adjacent bordered by the same spacing between panel clusters (one rep of 4 planned). Minimum height of the lowest part of panels above the soil surface would be 10ft (3m) to allow movement of tractors and farm equipment. It is hypothesized that different vegetable crops may have varying spacing requirements although a somewhat optimum spacing might be similar and achievable for many vegetable crops. A preliminary evaluation of vegetable crops is currently underway in the existing installation. We thank the Center for Agriculture, Food and the Environment, Diversified Construction, LLC, the Massachusetts Society for Promoting Agriculture, and the UMass Physical Plant for their support in this project.